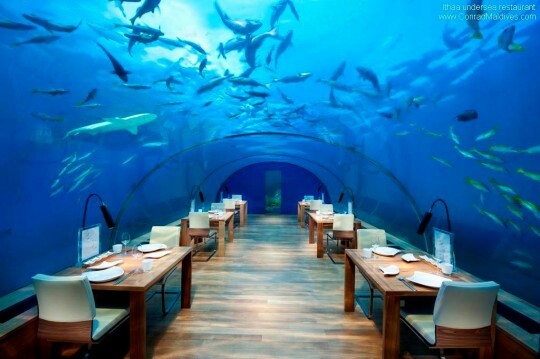 One decade ago, Ithaa Undersea Restaurant at Conrad Maldives Rangali Island was spectacularly ‘sunk’ five metres into the waters of the Indian ocean and ever since it’s been the mecca for lovers of food, culture and architecture the world over. To celebrate this momentous occasion, Conrad Maldives will be hosting a Twitter Chat on Wednesday April 15, 2015 which will take place at 3pm GMT (10am EST). Conrad Maldives Rangali Island invites the world to join the conversation and celebrate the birthday of this world famous dining location by sharing their memories of Ithaa on Twitter, Facebook and Instagram. Throughout the week of Ithaa’s birthday, users are invited to share their photos and memories using the hashtag #IthaaTurns10 users. Sitting like a pearl beneath the waves (Ithaa translates as ‘pearl’ in the Maldivian language of Dhivehi) the curved acrylic walls which give 180-degree panoramic views sets the trend for unique dining. It became the world’s first aquarium-style undersea restaurant – indulging diners with stunning views of the surrounding lagoon, reefs and tropical fish. Consistently recognised as the most beautiful restaurant in the world, Ithaa is fast becoming a 21st Century travel icon, so it is no surprise it is regarded as one of the world’s most expensive and exclusive places to eat. Envisioned by Mr. Ahmed Saleem of Crown Company PVT, owning company of Conrad Maldives Rangali Island, Mr.Saleem was inspired whilst travelling in Bali in 2001 and five years later Ithaa was brought to life by Mike Murphy of M J Murphy Limited in New Zealand who specialises in aquarium technology and at a cost of US $5 million, Ithaa took 85 tonnes of sand ballast (in sandbags) in order to be sunken onto the ocean bed. It wasn’t long before it became a cultural phenomenon and world-leader in beauty and cuisine that continues to intrigue and impress to this day. Conrad Maldives Rangali Island (@ConradMaldives) invites the world to celebrate Ithaa’s 10th anniversary through a live Twitter Chat. This global discussion will encourage fans of Ithaa to share their memories, photos and stories of this world famous and iconic restaurant. To coincide with the date the restaurant first opened its doors – April 15 – Ithaa will host a ChÃ¢teau Margaux sommelier dinner. The unrivalled wine estate of ChÃ¢teau Margaux dates back to the 17th Century and is renowned for its grapes as its prices. A bottle of 1787 ChÃ¢teau Margaux was sold for $225,000 making it one of the world’s most expensive wines. This is the first time ChÃ¢teau Margaux has been invited to host at Conrad Maldives.